Hello everyone ! 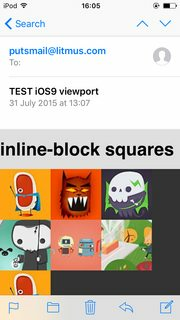 I've been testing Apple Mail in the latest iOS 9 beta this week on an iPod touch. I wanted to share with you my early findings. Unfortunately, while I have some good news, I also found some worrying unexpected new behavior. With this you can apply CSS filters (like blur, contrast, …) to the backdrop of an element, that is, what's beneath the element. Here's an example of a rotating square div with a backdrop-filter:blur(20px); on top of an image. You can read more about Advanced CSS filters here. 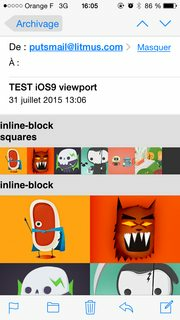 Apple Mail will ignore your width:600px;, and place the second picture below the first one. Here's an example of the same code seen on Apple Mail in iOS 8 and Apple Mail in iOS 9. Fortunately, this can be avoided by using min-width instead of width. From my tests, this doesn't seem to have a lot of impact on already optimized responsive layouts. 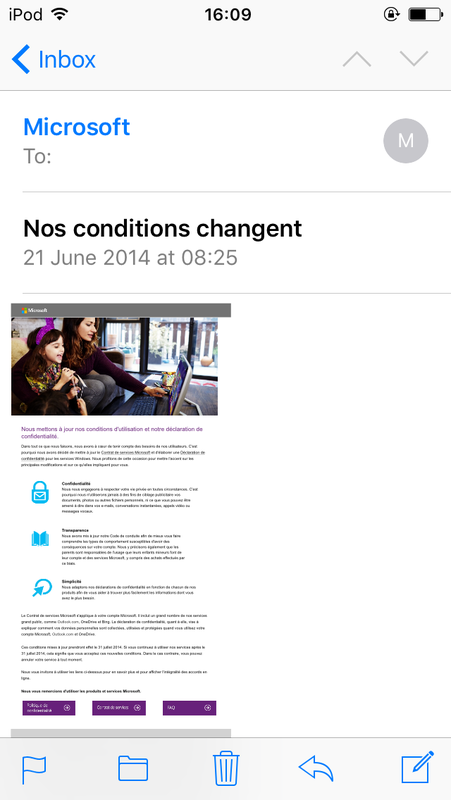 However, unexpected things happen with fixed width desktop sized layouts, like with this email from Microsoft. iOS 9 supports a new CSS feature, Snap Points that allows you to create dynamic scroll that will snap to precise points you determinate. While this works great in Safari, I've never been able to make this work in Apple Mail. This might be in part due to the new zooming mecanism previously mentioned that seems to break CSS overflows. This is too bad because I was really looking forward using this in emails. As previously reported on the first iOS beta, Apple Mail still can't play videos. The button is there, but clicking on it doesn't do anything. 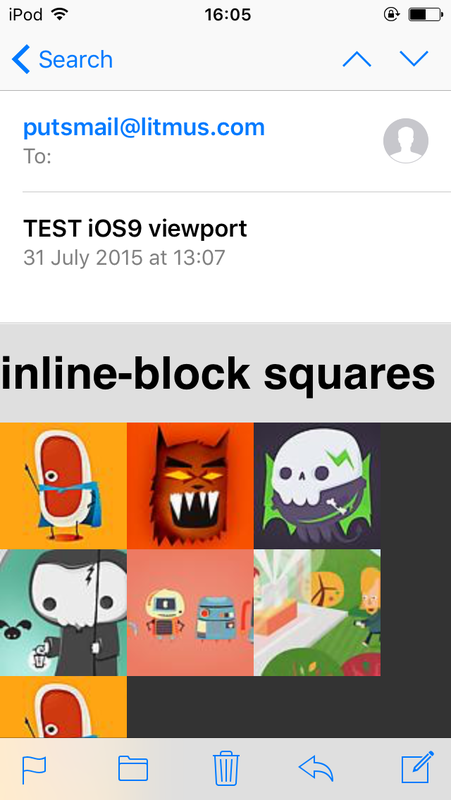 We're still a couple of months before iOS 9 gets released to the public. I hope these few bugs will be fixed (even though I have few hopes given the history of the video bug). You can try the public beta (even if you don't have a developer account). I'd love to have your feedback if you have found any other interesting things. Thanks for sharing your findings, excellent forward progression by Apple, now only if Google could modernize their rendering engine. 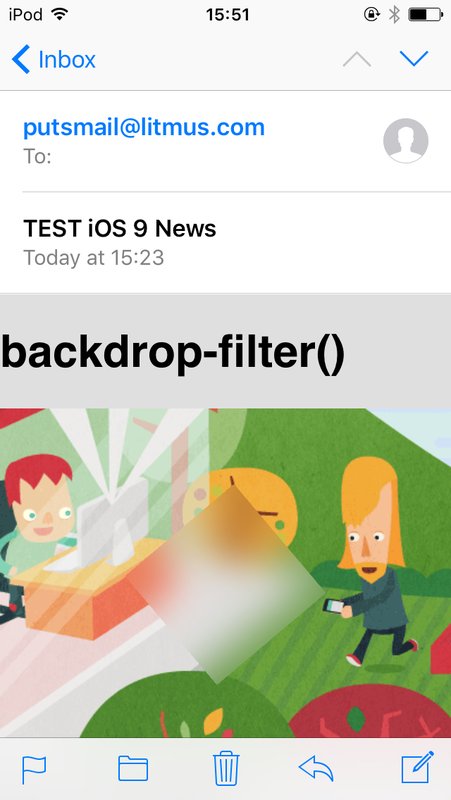 I also noticed today that emails viewed in landscape mode on iPhone 6 fall back to the desktop versions. Maybe that's because the resolution is desktop-sized in landscape? Bad news on scroll-snap was really looking forward to doing some cool stuff with that, hope they get it fixed. But great news on @supports caniuse says that as not supported on iOS9, I'll be very happy to have that as it's also got great support on Android email apps. srcset is also going to mean big changes for the better. I'm particularly excited about the inclusion of srcset. 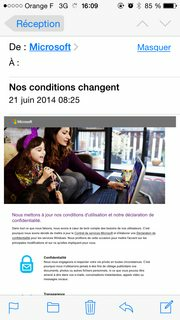 For better or worse, I get a ton of all-images emails from brands. srcset presents a low-risk / high-impact tweak for these types of senders to optimize the payload of their current email designs.